The 19th Amendment or more specifically now highly-debated Article 31 (2) of the Constitution on the term-limit of the President should be considered in its overall application and not specific to the future or the past. That is the way it is amended/drafted in the Constitution like in the case of the 18th Amendment. Whatever the criticisms that we may have on the Attorney General’s Department, it is difficult to imagine that they or others behind the drafting were unaware of the possible legal ramifications when they were finally drafting the 19th Amendment according to the Government’s specifications. They must have had some constraints due to political requests/pressure on other matters i.e. ‘powers, functions and duties of the President,’ but in the case of Article 31 (2), it is difficult to believe that it was the case. There is no apparent contradiction between the modified ‘powers, functions and duties of the President’ and the way he/she should be elected and the required qualifications. Both are in the democratic direction. The mere debate of prospective or retrospective application of constitutional amendments is completely outdated. There are so many other ways of amending or drafting constitutions (i.e. sunset, sunrise, continuity or transitional clauses, etc.) and what is important to ask is whether a particular clause or article is conditional or unconditional. Article 31 (2) in the 19th Amendment is unconditional and applies in the overall context of the constitution and office of the President. The Thirteenth Amendment in America outlawed slavery in 1865. Did this mean it outlawed ‘slavery’ for the future and not for the past, and the slaves before should have remained slaves? It is mere constitutional rhetoric that people like G.L. Peiris, Sarath N. Silva and Nihal Jayawickrama have been uttering in recent times directly and indirectly, arguing for yet another presidential contest for Mahinda Rajapaksa, and the only merit of Dr. Nihal Jayawickrama’s article (The Sunday Island, Colombo Telegraph and Daily FT) is that he has taken great pains to justify his claim/s. The 18th Amendment abolished the term-limit by repealing Article 31 (2) in the original Constitution of 1978. Did the amendment say it applies retrospectively? No. The 19th Amendment reintroduced it again of course with several other changes. The other changes were there even in the 18th Amendment. Both applied to the future as well as to the past or more correctly in overall terms. 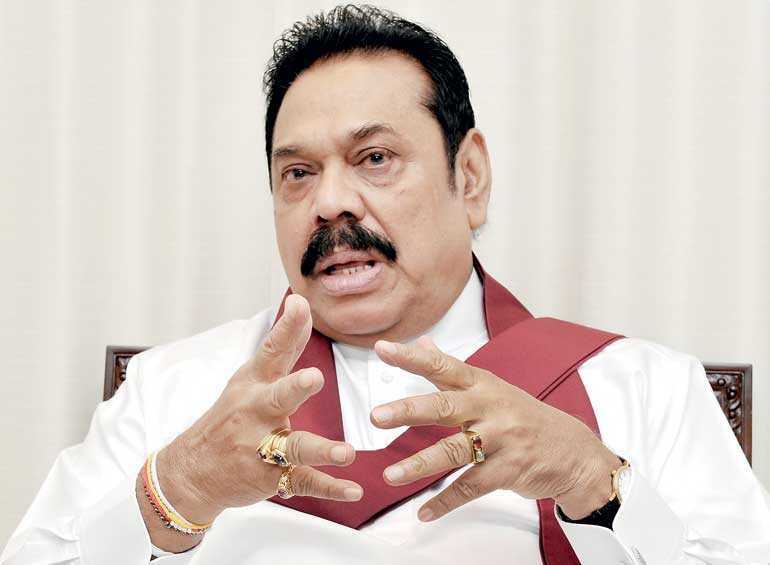 How come otherwise, Mahinda Rajapaksa managed to contest the January 2015 elections? Under the original 1978 Constitution as per the Article 31 (2), he was disqualified to contest again after he was elected to the presidency for the second time in January 2010. This must be the very reason why Nihal Jayawickrama has put forward a convoluted additional argument that the Presidency after the 19th Amendment is completely different to the Presidency before, or to the original Constitution of 1978. We should specifically note the term ‘thereafter’. This means Mahinda Rajapaksa was disqualified until the 18th Amendment was introduced in September 2010. Now he is disqualified under the 19th Amendment again which has the same effect as before. That is a correction to the previous democratic aberration. The aberration was in respect of the repeal of the term-limit with the characteristic tendency towards authoritarianism. How come that those who were silent on the absence of a ‘retrospective clause’ in the 18th Amendment in repealing the term-limit now thunder about its absence in the 19th Amendment? Prospective vs. retrospective debate is not completely limited to Sri Lanka although it is largely the past and not the present. In respect of the United States Akhil Reed Amar (America’s Unwritten Constitution: The Precedents and Principles We Live By, 2012) raised the following questions with legitimate inferences, ironically as if he was talking about Sri Lanka. He was talking in respect of how to interpret constitutional amendments. In my opinion, Sri Lanka needs a new approach (which is already there among more enlightened people) where constitutional interpretation should be based on not whether a clause or an amendment is prospective or retrospective, but whether it is conditional or unconditional. If the application is unconditional or overall, the prospective vs. retrospective debate does not arise. There are several conditionalities in the 19th Amendment but not in respect of the two term-limit or the (five year) tenure of the President. Therefore, they are unconditional. However, the ‘undesirability of retrospection’ does not apply in the same manner in the case of constitutional matters as in the case of ordinary law. Because a constitution is fundamental law of a country and when a Parliament or a Parliament plus people at a referendum approves a new constitution or a constitutional amendment they do so (presumably) under considerable consideration. Therefore, in a constitution, if a particular article, provision or clause is not specifically conditional, its application is overall. Whatever the reason, as we know, the incumbent President Maithripala Sirisena requested the Supreme Court to determine whether he could continue until January 2021, for six years, as he was elected in January 2015 before the 19th Amendment. Irrespective of the lack of a retrospective clause in respect of 30 (2), which was enacted in May 2015, the SC determined that the incumbent President’s term in office is limited to five years from January 2015. Because the specific amendment to the tenure (from six to five) was unconditional. It is well-known that the former President Mahinda Rajapaksa declared that time, if the SC determines in favour of President Sirisena, he himself could run again for the Presidency (Indian Express, 15 January 2018). However unfortunately, things didn’t turn up that way. His tongue-tied position thereafter was an implicit acceptance of the verdict that the absence of a retrospective clause would not preclude its application in overall terms or even in ‘retrospective terms’. Sri Lanka is well known for passing legislation in retrospect, when it suits political ambitions or necessary for political vengeance. In 1971, the then Government passed the Criminal Justice Commission (CJC) legislation to prosecute the JVP leaders, making previously noncriminal acts suddenly criminal. Otherwise many of those who were prosecuted did not indulge in criminal acts although the whole insurrection was a ‘criminal offence,’ in my opinion, in political terms. There were so many well-meaning people who were unfortunately incarcerated. The most ironic in the present situation is that Nihal Jayawickrama who now opposes introspection was a key person who brought the CJC legislation in 1971 as the Permanent Secretary to the Ministry of Justice. The general democratic reservations on retrospective application that they ‘infringe the principles of rule of law’ are in respect of ordinary legislation or law, covering legal rights and obligations and criminal offenses. However, this is not the case in respect of constitutions or constitutional amendments. Otherwise, what is the difference between fundamental (constitutional) law and ordinary law? For example, when a fundamental rights chapter of a constitution is changed, that applies in overall effect (present, past and future) empowering the whole population on those new rights. The same goes unfortunately for obligations, restrictions or reductions in rights. That can be done by a new constitution or constitutional amendment but not by an ordinary law without infringing the principles of rule of law. Because the principles of rule of law while emerges in and generally consistent with international law and democratic and justice principles, hinges within a particular constitution in a country. That is another reason why a constitution or an amendment itself should be democratic and consistent with justice principles and should not unnecessarily place conditions retrospectively (i.e. disqualifications on dual citizens) unless some democratic principles are necessary in overall terms, like in the case of term-limits and limited tenure. The people’s or their representative’s intent is primarily important, in interpreting an amendment, unless it is blatantly negated in legal drafting. There is no such a blunder in the case of the term-limit (re) imposed for the election of President in the 19th Amendment, whatever the other defects. The intent can safely be identified as the ‘need to re-impose the accepted democratic principle of two term-limit, which was there in the original constitution, and accepted by democratic and civilised nations’ (See Michael Korzi, ‘Presidential Term Limits in American History: Power, Principles and Politics, 2011). This is about the qualification or rather the disqualification of a person who would intend to stand for the presidential election under the current circumstances. The right question to ask is ‘have you been elected twice by the people to the presidency?’ If the answer is affirmative, the person is roundly disqualified. Neither Mahinda Rajapaksa nor Chandrika Kumaratunga can say, ‘yes, but before the 19th Amendment in May 2015.’ They were even disqualified before the 18th Amendment in September 2010. Because this was exactly the same in Article 31 (2) in the original Constitution of 1978 which became deleted for ambitious political reasons in the 18th Amendment. Therefore, the democratic aberration was in the 18th Amendment and not in the 19th. It is quite inappropriate for a person like Nihal Jayawickrama to raise the issue as an apparent ‘rights issue’ in the case of MR or CBK. Are democratic principles valid considerations for constitutional interpretation? For G.L. Peiris or Sarath N. Silva, those democratic principle might not be relevant. But it would be strange, if Nihal Jayawickrama disregard these considerations. Under modern circumstances, legal principles and democratic principles are increasingly the same and should be the same. Even if the legal scholars appear to discard the democratic principles, the political science students and scholars should uphold them in constitutional interpretation. It is true that the argument by Nihal Jayawickrama about the absence of retrospective application of the term-limit in Article 31 (2), particularly hinges on the premise that what is created by the 19th Amendment is a New Presidency and not the Old Presidency or a Reformed Presidency. Therefore, in his ‘legal opinion’ the term-limit disqualification does not apply to those who held office prior to the 19th Amendment. This argument is farfetched although it may have a democratic merit when it is taken in isolation to interpret ‘powers, functions and duties’ of the President. He goes to the extent of saying that the Presidency that is ‘newly created’ by the 19th Amendment is ‘essentially non-executive, primarily symbolic and ceremonial.’ This is highly questionable. How come that such a drastic change is achieved without referring to the people at a referendum as required by the constitution? If he is an independent scholar, Nihal Jayawickrama should criticise this lacunae or the misadventure, without trying to justify the eligibility of this or that past President for further election.